Thank you to Phoenix Community ToolBank for this beautiful write up on their Facebook page. We love hearing the amazing projects our member agencies use #bluetools for, but we also LOVE sharing with you those same amazing projects and volunteer passions! Check out this month’s #MemberAgencySpotlight brought to you by Singleton Moms. Singleton Moms’ volunteers hope the day will come when cancer has a cure and can no longer threaten lives and rob children of their parents, but until then, these cheerful volunteers tend to tasks and chores that can overwhelm a single parent fighting a terminal illness. Alma Henriques is a Care Team Specialist at Singleton mom. She contacted Phoenix Community ToolBank last November as she set out to help a single mom with some yard work. Like many Arizonans, this mom had a wily patch of Aloe Vera spreading beyond the confines of pots and planters. Alma borrowed rakes and shovels from Phoenix ToolBank and with the help of four other volunteers, trimmed back the succulents and cleared away mounds of dead tree debris. 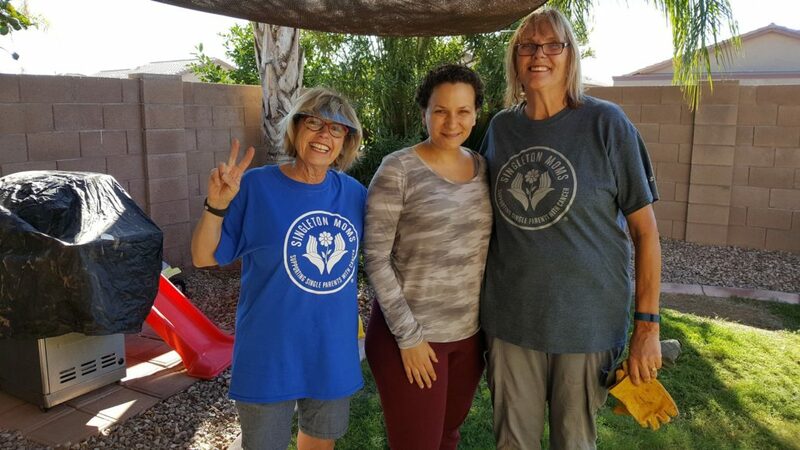 When asked about her experience with Phoenix ToolBank, Alma told us that she felt supported no matter how many questions she had for Phoenix ToolBank’s Executive Director, Jana Smith. And anyone who has worked with Jana would likely agree with Alma who described her as “ridiculously friendly and always available.” Alma also loves being able to borrow just about any tool they need to make their mission possible. Singleton Moms is planning lots more spring cleanings and yard work before the hot summer months kick in. With your support, Phoenix Phoenix Community ToolBank will continue be there for Singleton’s Moms and single parents battling cancer.